It's crazy to think that this terrific graphic novel started being published in the summer of 2015, considering how well it seems to be responding to the events of 2017. 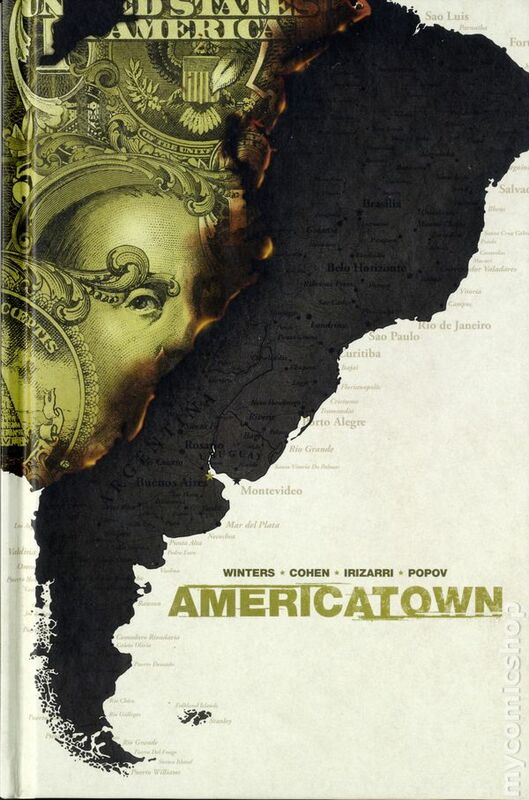 Americatown, written by a couple of TV writers, is about undocumented immigrants from America eking out a life for themselves in Buenos Aires, having to deal with ruthless smugglers, heartless Immigration officers, and an orange-skinned mayor who is staking his reelection campaign on showing "tough love" to people who are in the country illegally. The story is set in the near future (Bruce Springsteen is a very old man) and, as inequality and climate change have worked hand in hand to erode living standards in the US, many people find they have no choice but to risk their lives to arrive in Argentina, where the lucky ones subsist by working multiple jobs and living in shared apartments. Owen Carpenter is a new arrival, but he's had some help getting there. His son has started working for Tonto, an American Native who runs a successful smuggling ring. While Owen and the people he travelled with are waiting in a safehouse, La Migra raids them, and Owen and his son, Derek, are able to escape, running over an officer in the process. Derek gets nabbed, and ends up in prison, while Owen tries to figure out how things work in Buenos Aires's Americatown. He finds jobs and friends who are willing to help him, and puts a plan into action to try to reunite his family. This book is a very compelling read. The inversion of having privileged Americans selling hot dogs on the street and complaining that they can't celebrate the Fourth of July openly is a novel one. It draws attention to the plight of migrants, but also raises some much needed warnings about where the world is headed. Winters and Cohen put together a tight story, although I thought that the ending was a little needlessly ambiguous (maybe I'm just tired though). Irizarri's art is very nice, and I especially like the little ways in which he introduces extrapolated versions of modern technology. Apparently the serialized version of this series got cut short, with half the run only appearing online, but this handsome hardcover is probably the best way to read the story anyway.